SCHEDEL -[With portrait of Paulus Venetus - Sexta Etas Mundi. Folium. CXX ]. SCHEDEL, H. - [With portrait of Paulus Venetus - Sexta Etas Mundi. Folium. CXX ]. [With portrait of Paulus Venetus - Sexta Etas Mundi. Folium. CXX ]. - SCHEDEL, H.
Title : [With portrait of Paulus Venetus - Sexta Etas Mundi. Folium. CXX ].. Size : 13.6 x 8.9 inches. / 34.5 x 22.5 cm. 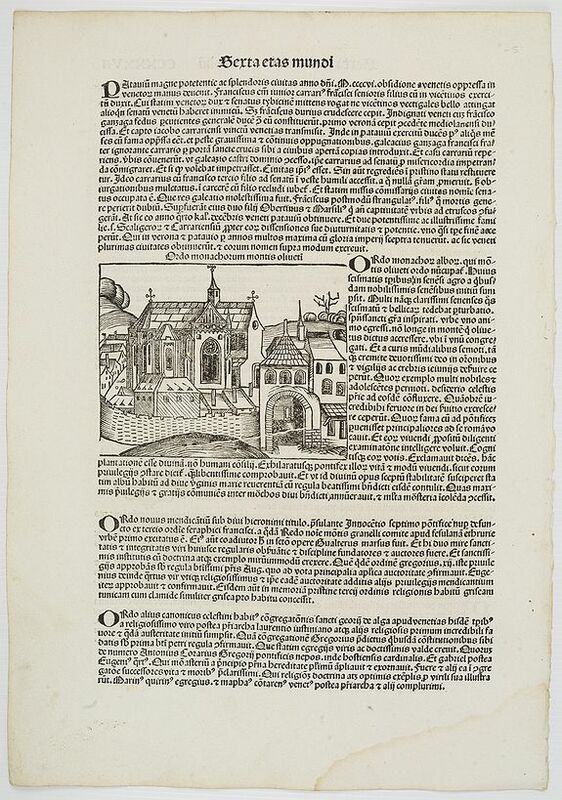 Description :On the verso text page is a woodcut depiction of a typical town with its church and medieval ramparts. RECTO : has two portraits, one representing Paulus Venetus (1368-1428) who was a Roman Catholic theologian and logician of the Hermits of the Order of Saint Augustine. Condition : Some light staining in lower margin. Dark impression on large sheet. Else good condition.